Be part of the Dragon Army! 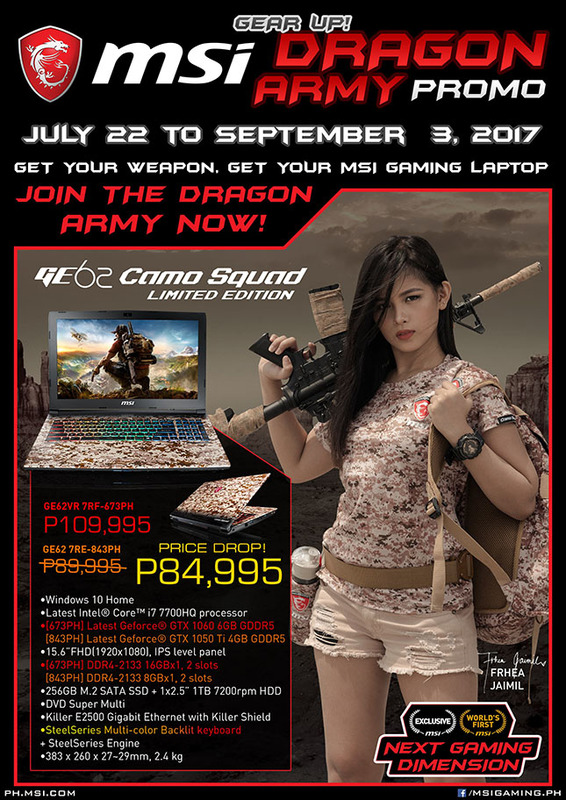 Get your weapon, get your MSI gaming laptop and WIN prizes! Buy your new MSI Notebook from the authorized stores and get a chance to win prizes! The Grand Prize Winner will get a trip for two (2) to Tokyo Game Show 2017 with round trip tickets and hotel accommodation from September 22-24, 2017. 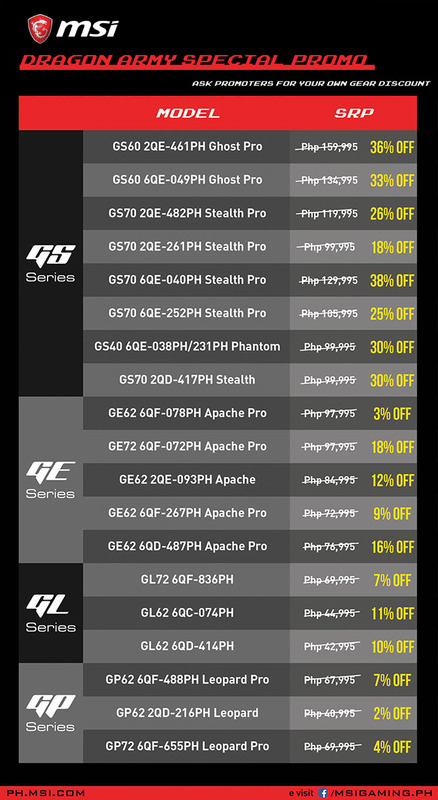 2nd prize winner will get a GT72 2QE-1048PM Dominator Pro (worth Php195,995), 3rd prize winner will get a GS60 2QE-249PH Ghost Pro (worth Php 99,995) and the 4th prize winner will get 2 sets of steelseries Siberia 650 Black Headset (worth Php 8,500). MSI will also be giving away the following consolation prizes: 50 sets of Dragon Medium Doll, 30 sets of MSI Neck Pillow and 100 sets of BTS Bundle which includes MSI mouse, mouse pad and exclusive token. Lucky winners will be announced on September 7, 2017 via livestreaming on MSI facebook page. 1. By entering the Raffle, you agree to be bound by these Terms and Conditions. Any raffle entry and participation instructions form part of these Terms and Conditions. Any entries not complying with these Terms and Conditions will not be valid. 2. The promo period is from July 22, 2017 until September 3, 2017. 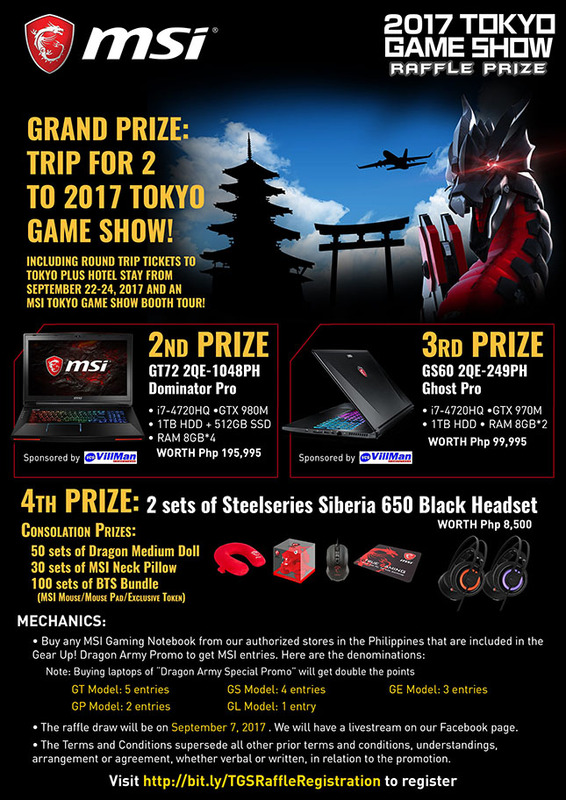 Grand Winner Trip to Tokyo game show( dual), including Round trip Airfare Ticket to Tokyo+ Hotel stay from Sept 22- Sept 24, 2017 and an MSI Tokyo game show booth tour with tickets. 6. Participants of the raffle must be at least 18 years of age at the time of entry. Verification of your age will be required when you claim your prizes. 7. Upon purchase, go to ph.msi.com and submit your entry. Like and share this post in order to be eligible for the promo. 8. Raffle Draw will be on September 7, 2017 on the MSI Gaming Facebook page. 9. The winners will be notified by the MSI Philippines Notebook team through telephone or e-mail. 10. The winners may be required to take part in publicity related to the Promotion including having his or her photograph taken and his or her name, nationality and country of residence being disclosed. 11. To claim the prize, winners must present at least one (1) valid ID, proof of Qualifying Transaction, and screenshot of liking and sharing this post. a. MSI Philippines will only be shouldering the airplane ticket, hotel and 2017 Tokyo Game Show Ticket. Any other requirements for going to the US will be arranged by the winner, such as Visa, etc. 13. The prizes are not exchangeable or transferable and not convertible to cash. 14. 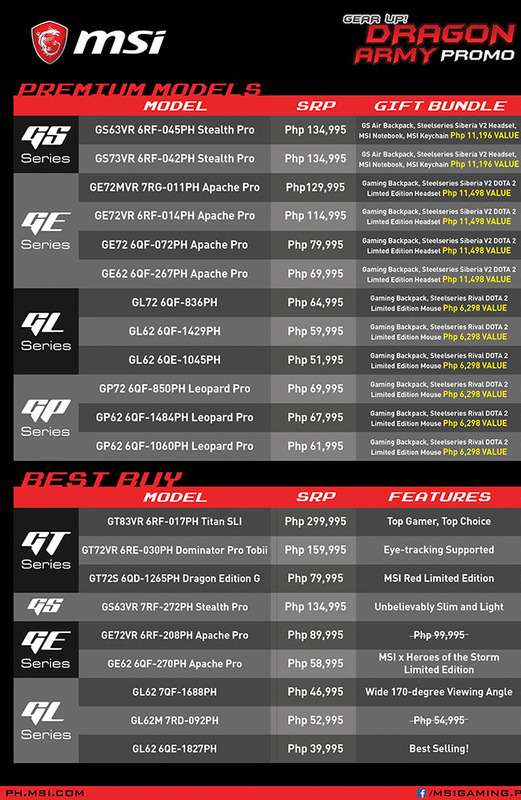 MSI Philippines Notebook reserves the right to change the prizes to another prize, which has the same value, anytime within the promotion period. 15. If any winner is subsequently found illegible to participate in this Promotion, MSI Philippines Notebook may at its sole discretion forfeit or reclaim the prize and award or dispose of the same in such manner and to such person as it deems fit. 16. In case of any dispute, the final decision lies with MSI Philippines Notebook. They reserve the right to change/void the promo at any point of time without any prior notice. 17. MSI Philippines Notebooks decision in all matters to do with the promotion is final and no correspondence will be entered into. 18. These Terms and Conditions supersede all other prior terms and conditions, understandings, arrangements or agreements, whether verbal or written, in relation to the Promotion. Get your very own MSI notebook today, gear up, and giveem hell!